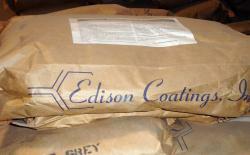 Systems for repair, leveling, decoration and protection of industrial and commercial concrete. DECK-TOP 47 and 47-RC are two-part, latex modified, concrete patching and resurfacing compounds designed for high-performance in both deep repairs and thin-section topping applications. DECK-TOP applications of 1/8" to ¼" thickness withstand heavy vehicular traffic, impact and vibration without loss of adhesion or rapid wear. Available in Standard Grey or a wide variety of custom colors. Low odor, High-gloss, chemical and water-resistant waterborne epoxy coatings available in two grades: 1) A heavy duty immersion grade coating for floors, walls, machinery surfaces, tanks and pools, Suitable for continuous water immersion after cure. 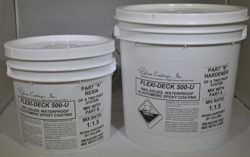 2) A medium duty sealer for concrete floors. Both may be applied to damp or "green" concrete. Low viscosity, odorless, 100% solids, self-priming flexible epoxy coating. 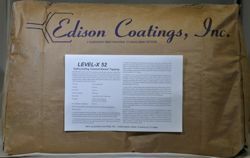 Used as elastomeric primer for rigid epoxies, as flexible hardcoat over 500-U membranes, or for mechanical room and industrial floor membranes. Low viscosity, flexible, odorless primer, bonds to ceramic and vinyl tile, wood, smooth concrete, oil-contaminated concrete and metal, many previous epoxy coatings. 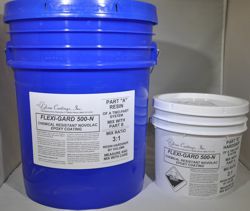 FLEXI-GARD 500-N is a 100% solids, odorless, VOC-Compliant epoxy coating system designed for maximum resistance to chemical spillage and immersion, heavy industrial traffic and elevated temperatures. 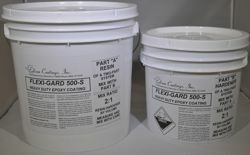 FLEXI-GARD 500N-FLX is a flexibilized base coat used in applications such as secondary containment where improved resistance to telegraphing of minor substrate cracks is desired. 100% solids, odorless, USDA-accepted clear or colored floor coatings Also available in 90% solids (500S-90) for easy handling and low cost. Withstands a wide range of chemical exposures. 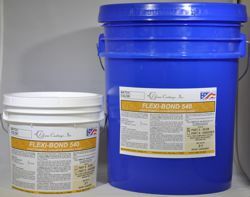 FLEXI-BOND 540 is a two component, 100% solids, moisture-insensitive epoxy bonding agent. Application of FLEXI-BOND 540 to wet or dry, properly prepared substrates assures tenacious adhesion of new toppings, patching compounds and tile bedding mortars when used in accordance with instructions. It may also be applied to steel, tile, wood and fiberglass. It can be used as a combination waterproof barrier and bonding agent when applying new concrete toppings over old concrete. It can be used to improve adhesion of tile bedding mortars to existing concrete, or may be used directly for tile bedding in combination with very fine sand. It can be used to prime and waterproof steel reinforcement prior t application of patching compounds or concrete pouring while improving adhesion of these materials. It can be used to penetrate and consolidate low strength floors, such as asbestos-cement or cinder concrete, and to improve adhesion of new toppings or patching compounds to same. It can be used to promote adhesion of concrete, bedding mortars or toppings to non-cementitious substrate, such as tile, plywood decking, or steel plate. 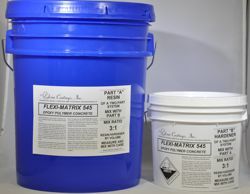 FLEXI-TOP 550 & 555 are heavy-duty, 100% solids, odorless epoxy mortars far patching and topping of commercial, institutional and industrial floors. FLEXI-TOP 550 is a self-leveling surfacing system providing heavy-duty protection at l/8" to 1/4" thickness or more. Blended with select aggregates, it forms a fluid mixture which easily spreads with a V-notched trowel or squeegee. Upon curing, it forms a dense, non-porous flooring that resists chemical and water penetration, dirt pick-up, and heavy traffic. 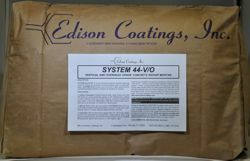 It may be sealed with a number of protective topcoats for improved skid resistance, gloss and color retention. 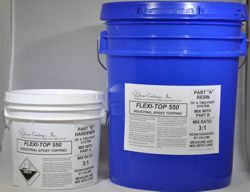 FLEXI-TOP 555 is a versatile trowel-applied mortar used for patching or toppings of 1/4" or more. Blended with specially graded aggregates, it forms a dry, trowelable mortar that can be applied by hand or power trowel. This mortar is then grouted and sealed with 100% solids resins to eliminate porosity and produce a dense, non-porous, slip-resistant finish. Marine-FLEX 570 is a 100% solids, medium viscosity, moisture insensitive epoxy coating intended for heavy marine and wet industrial exposures. Marine-FLEX 570 CAN BE APPLIED UNDERWATER , as well as on wet, damp or dry concrete or steel surfaces of exposed to air. 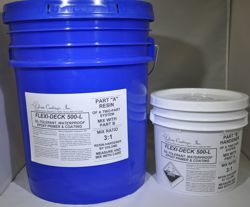 Various aggregates may be purchased for use in epoxy floor toppings and coatings, or for modification of standard products in accordance with manufacturer's instructions. EDISON AQUATHANE UA-210 Type XL additive promotes chemical resistance and toughness through further cross-linking of the urethane polymer. 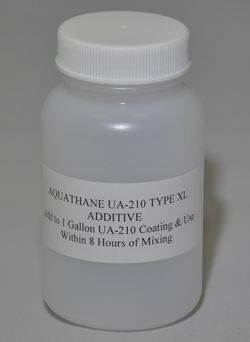 Added to the corresponding size container of Aquathane UA210, Type XL additive chemically reacts to form strong durable crosslinked coatings. Use within 4 hours of mixing. 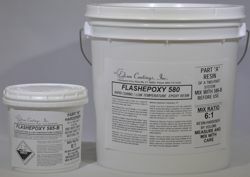 Epoxy Coatings test kits allow small-scale mock-up installation prior to larger volume purchases. Select from the list of standard colors or designate custom color (if known). Select proper grade to match required performance properties and composition.